Do you have a stash of used wine corks? I totally do! I've always thought that even if I never come up with a clever craft I can at least recycle them at Whole Foods. This project from Fiskars, though, is genius. It's super cute and doesn't scream "I drink way too much wine!". It also doesn't require hoarding wine corks for a year or more like some cork projects. Great idea and thanks for sharing it. I'm definitely going to make some. I'm thinking these would make great wine glass charms - maybe with individuals' names! thanks for the idea! Hi! These are sooo cute! The link doesn't work any more. Any chance you have instructions saved somewhere. Curious how to use sand paper and stamps/paint. Thanks!! That's too bad that the link isn't working! The basics are that you use the small table vice (if you have one) to clamp the wine cork and use the small craft saw to saw off slices of the cork about 1/4 thick. 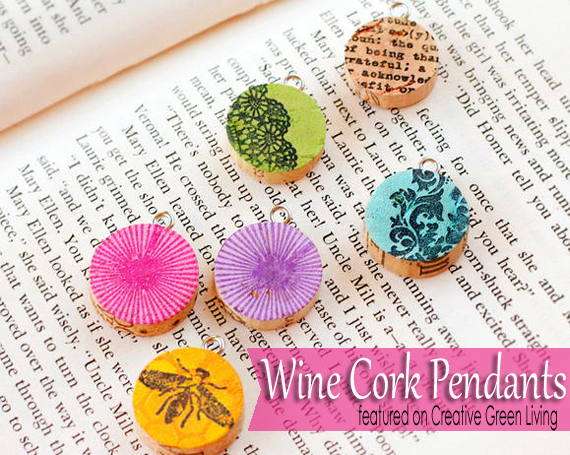 Use sand paper to clean up any rough edges and then you paint and/or rubberstamp on the cork. To turn into a charm, screw a small eye screw into the top.